Due to recent App Store changes, event organizers looking for a mobile event app may find themselves needing to create their own Google Developer account in order to get their app published. We understand the recent changes may cause uneasiness and confusion, but we’ve got you covered! In the event that you need to publish your app to your own developer account, you will need to take the steps outlined below. As always, if you have any questions or need assistance, please reach out to our Support team via chat or email us at support@attendify.com. 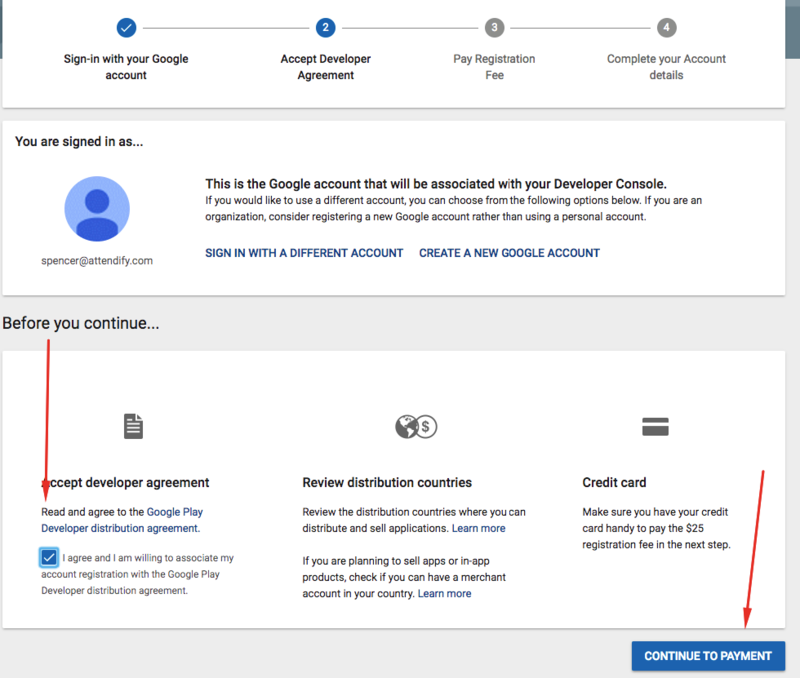 During the sign-up process, you’ll need to review and accept the Google Developer distribution agreement. Complete your account details. Your “Developer name” is displayed to customers on Google Play. Sending Attendify an invite and granting us permission to access your account is required so we may publish the event app on your behalf. Account owners or admins can send the Google Play invitation to the Attendify Team. Click Settings > Users & permission to add a user, select Invite new user and follow the onscreen instruction to set permissions. Use the “Role” selector to choose a pre-defined role or use the checkboxes for individual permissions. Choose whether each permission applies to all apps in your developer account (“Global”) or specific apps. To add an app to the permissions table, use the down arrow next to “Add an app.” To see details for each permission, review the permission definitions section. Attendify publishes on Google Play for Android devices and the App Store for iPhone devices. You will also need an Apple Developer Account to publish a fully branded app. If you haven’t set up your Apple Developer Account yet, you can find step by step instructions here. Should you have any questions feel free to chat in on any Attendify webpage or email us at support@attendify.com.